Last year they came, they saw and they conquered, now they’re back, and they’re more powerful and faster than ever. The Fiercely Driven arrive in Rome with one purpose only, to win the Throne of Rome with fans ready for the games to begin. The all-electric ABB Formula E championship begins its season five European leg, at the eternal city of Rome, Italy. In the land where men once became Gladiators, twenty-two drivers will battle at the street circuit sited in the EUR neighboorhood on Saturday. 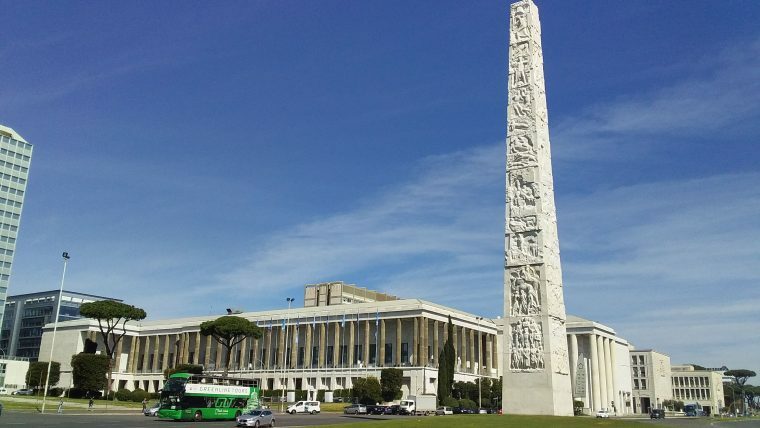 In this area of the city the “Colosseo Quadrato”, called this way due to its square shape, stands tall waiting to meet the first winner of the Formula E second generation cars. From Monday, the fans started to live an action-packed week with a series of activities scheduled to welcome the electric series for the second time in the always splendorous city. Over 35.000 spectators are expected for the Geox Rome E-Prix, as the event is sold out weeks in advance. On Monday and Tuesday, EUR residents could experience what feels like to drive a Gen2 car as two simulators were in place at Largo Apollinare, in the EUR area. On Thursday, a beneficent event will take place at the stadium “Tre Fontane” also in the EUR. 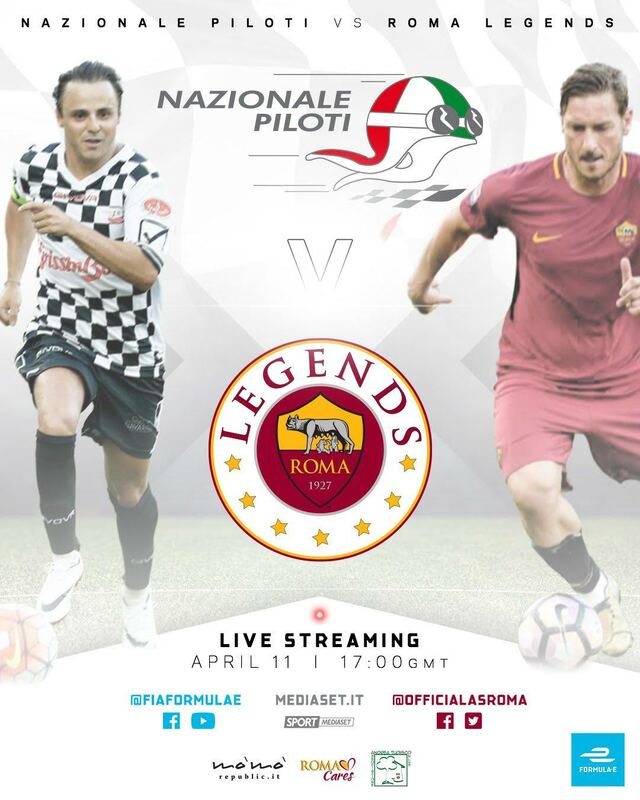 Drivers such as Brazilian Felipe Massa, reigning Formula E champion Jean-Eric Vergne, first ever Rome E-Prix winner Sam Bird and current championship leader Antonio Felix da Costa are some of the names that will represent the “Nazionale Piloti team”, at the time that the ball rolls in a friendly football match against the “Roma Legends team” led by no other than former AS Roma captain, Francesco Totti. The “Andrea Tudisco” Onlus Association and “Rome Cares” are the institutions selected to receive the donations. On Friday, The Jaguar I-PACE eTROPHY will debut on Roman soil when the cars come out for free Practice, previously, the Gen 2 cars will head to the track for a thirty-minute shakedown. Also on Friday, the Allianz E Village will be open, so fans can enjoy sports activities with the presence of the Paralympic Sportive Asociation of Basketball, Hockey and Rugby. New this year, the E-Parade, an eco-friendly activity, which will also take place on Friday, giving the chance to anyone with an electric or zero-emission vehicle to drive through the race track, electric bikes included. The day is set to come to an end in style with a concert for the fans to rejoice, local musicians Cosmo e Foresta will give a special show, free of entrance. Will she come to stay? It could be an unexpected guess to be the one which takes all the glory. Once and again, the forecast shows the rain could fall on Friday and Saturday, in fact, the weather has been unstable since the early beginning of April but until then, the sun may find its way to keep the series waterproof. Either way, one thing is for certain, another unpredictable race is ahead of us, the street circuit that features 21 turns along its 2.87km layout will challenge the drivers and the wider Gen2 cars. 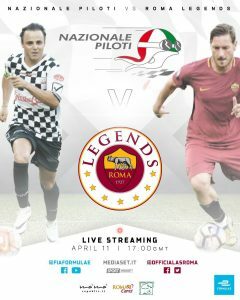 Will Bird consolidate as the “King” of Rome this Saturday? or could Rome meet the seventh winner of the season? The championship is open just when it reaches round 7 out of 13, the current standings show BMW i Andretti Motorsport driver da Costa as the championship leader with 62 points, only 1 point ahead of Mahindra Racing driver, Jérôme d’Ambrosio. 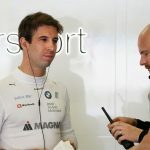 Reigning champion, DS Techeetah Formula E team driver Vergne, follows in third with 54 points, the exact same points that Bird, the first Rome E-Prix winner, has. 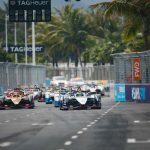 The E-Prix will also see the return of Briton Alex Lynn as the new teammate to Mitch Evans in the Panasonic Jaguar Racing, replacing season one Formula E champion Nelson Piquet Jr, both parted ways after a consistent lack of results. Cecilia is a freelance Journalist passionate about motorsport and writing. Her articles are published in newspapers and online international media as well. Her knowledge goes from F1, F2, and GP3 to other series such as MotoGP, IndyCar, Rally, WEC and particularly Formula E.